Monday to Wednesday of this week is our big Take Back the American Dream conference in Washington DC. If you weren't able to attend in person, you can still see the live stream of all the great speakers and interesting panels online. Read the schedule here, and watch live on this page. Visit OurFuture.org for more details on the conference. A coalition of liberal organizations are planning to push for a liberal agenda and recruit progressive politicians at every level of government -- with or without President Obama.Taking hold of the momentum generated by the "Occupy Wall Street" protests occurring across the country, the liberal leaders have drafted plans to implement what they call an "American Autumn" -- a realignment of American politics inspired by the pro-democracy protests in the Middle East dubbed the "Arab Spring. "Gathered in Washington for an annual progressive conference -- this year called the "Take Back the American Dream" conference - the leaders said that liberals this year have a new-found sense of energy and enthusiasm. "People are moving, they are moving on their own," said Robert Borosage co-director of the Campaign for America's Future. "They understand the need for action." 3) And on Wednesday, the highlight of the day was a big "Jobs Not Cuts" rally on Capitol Hill. 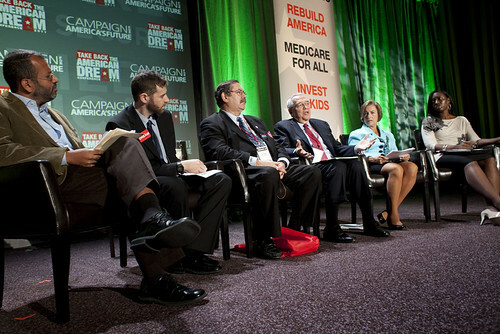 Van Jones emceed the rally, sharing the stage with fourteen wonderful fellow Americans, including an emergency room nurse, President of the Professional Firefighters of Wisconsin Marlon Mitchell, a jobless worker from Pittsburgh, and Representatives Keith Ellison, Raul Grijalva, and Sheila Jackson Lee. Perhaps the most moving speech came from unemployed home caregiver Linda Evans, whose voice quivered from despair to anger as she wept, crying out to Congress, "How can you sleep at night? How can you sleep knowing that people in the District of Columbia are hungry, living at a poverty level? "You can watch highlights of the Wednesday rally here:After the rally, dozens of unemployed workers delivered job applications to supercommittee members to make sure that they focused on job creation instead of cutting key programs.The flurry of conversation and inspiration this week wasn't the start of the American Dream Movement, which got its initial spark from the stand in Wisconsin in the spring of 2011. And it most certainly isn't the end - protests, marches, and creative direct actions will only increase throughout the fall, culminating in a wave of action on November 17. And as those actions increase, the movement will continue to set its roots deeper, engaging one million leaders across the country and recruiting over two thousand progressive candidates from the school board on up. We're only just getting started.Read here about what's next for the American Dream Movement.For a full look at our coverage of the Take Back the American Dream Conference on the blog, we've got it all in one spot right here. 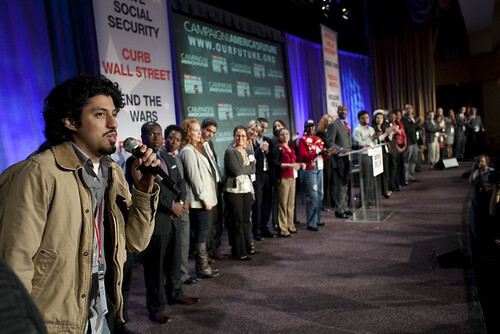 Now that we've had our first American Dream Movement summit, what is next? 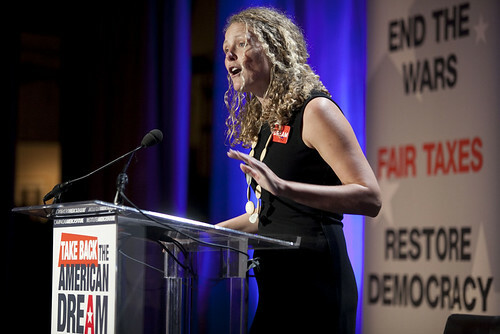 Rebuild the Dream co-founder Natalie Foster took the stage at the Take Back the American Dream Conference to answer that very question.With the spark of massive resistance in Wisconsin, the American Dream Movement has steadily chipped away at the austerity agenda around the country and it's working. Our political leadership has begun talking about creating jobs, not cuts. The president put an American Jobs Act on the table, and progressives in Congress are pushing a bold strategy to create jobs as well.But that's not enough and we’re not done; we're just getting started. So what's next for the American Dream Movement? Natalie proposed an audacious three-point plan.1) American Autumn: November 17 National Day of Action Starting with a wave of actions around the country next week (October 10-17), we’re building towards a massive day of action on November 17. On that day, we will hold members of Congress accountable -- we will punish those who oppose job-creating legislation, and we will praise and support those who push hard for real solutions. We need jobs, not cuts. We need economic growth, funded by making the wealthiest pay their fair share.We will especially target members of the so-called Supercommittee, and all of the 12 members of the Supercommittee will have to directly contend with residents in their states and districts. (The Supercommittee is the special congressional committee charged with coming up with $1.2 trillion in deficit cuts by Nov. 23. Failure to do so would trigger automatic spending cuts in defense and domestic programs. )You can sign up at November17.org. Use that website to get more information on the thousands of actions that will be held on (you guessed it) November 17.2) Run 2,012 American Dream candidates in 2012 Natalie called on us to build power at the ballot box, from the bottom up. That’s why we’re recruiting and supporting at least 2,012 American Dream candidates to run in 2012 -- in all 50 states from school Board on up to Congress. New Organizing Institute’s Candidate Project, led by Carlos Odio – a rising American Dream leader, and Progressive Majority and are taking the lead on this.3) One million local leaders Although electoral power is key, change doesn’t begin or end with electoral politics. We’re calling on one million Americans to step up as American Dream leaders. We started in churches and synagogues, union halls and living rooms — and that’s where we’ll grow.How will we engage with a million people? It will take hard work, to be sure. But it is within reach. In just the last three months, hundreds of thousands of people have taken action online, and tens of thousands of people have met at local American Dream meetings in every congressional district in the nation. And we've barely begun. We’ll hold house meetings and teach-ins on economic policy, we’ll work with entrepreneurs to test out new shareable ways of working together. And we’ll spark scholars, creatives, videographers, graphic designers to engage their communities and produce and create what a movement needs.After Natalie's presentation, I asked her to give a message to our readers. Here's what she said:"This historic moment is YOUR moment. The American Dream Movement is YOUR movement, a common banner under which we all can march. Th American Dream Movement must be led by local leaders and volunteers in every community, driven from the ground up. "It must be led by YOU. Let's join together. It's time." . As we approach 2012, it's increasingly important that we as progressives do more than criticize the right - we must hold the people we put into office accountable for representing our interests, whether on the county school board or U.S. Senate. Gloria Totten, Julie Martinez-Ortega, Mike Podhozer, and Rashad Robinson brought this point home on Tuesday at the Take Back the American Dream Conference. Totten is president of Progressive Majority, an organization that aims for voting as many progressives into office as possible to make a real difference in city, state, and national politics. At Progressive Majority they have been testing different ways to hold people accountable in the electoral arena. In the state of Washington, for example, they started a program called the Democratic Upgrade Project. The project takes a systematic look at how the organization can upgrade democratic seats to a progressive majority; in Washington, they're only 5 seats shy from their goal in state legislature.They also took a symbolic victory when Nick Harper, a young environmental activist, won a highly contested race against Jean Berkey for State Senate. For Totten, Haley is an example of how you can replace someone who has simply been in office for too long with someone vibrant from the community. "Sometimes it's really fun to fight with our own folks and go after our own people," said Totten. "But it's also important to remember that there are different ways to do this that keep us moving forward and not just constantly engaged in the same old fights. "Julie Martinez-Ortega works to engage people of color in the electoral arena with PowerPAC.org. She thinks the biggest key to putting progressives in office is making sure that we stay aware of demographics - who is voting for us, and how those numbers are shifting. "Wake up and do the math," she said. It's been proven that African American, Latino, Asian, and labor voters tend to vote progressive at significantly higher numbers than whites. And Martinez-Ortega thinks monitoring those numbers will lead to a victory.She also thinks it takes year-round citizens to hold progressive officials accountable. While in many ways it does begin with selecting great candidates who carry on progressive work year-round to keep people engaged, those people must recognize their work isn't over at the ballot box. Without pressure, the candidates we've elected won't represent our needs.From Color of Change, Rashad Robinson has found that his work constantly walks the line of organizing and advocating for not just black candidates but all those who represent the needs and interests of the black community.One example was in the last presidential election. The Congressional Black Caucus decided to host a debate sponsored by FOX news. This didn't sit well with Color of Change staff or members, so they organized to ensure that mainstream media asked tough questions about the corporate ties behind that process. They researched how the Black Caucus was influenced by corporate needs and how this diverted them from serving the African American community. "You don't make a lot of friends, you don't get invited to the parties afterwards," said Robinson. "But you make the process better in the end; I'll be very surprised if that caucus will hold a debate with FOX anytime soon. "Mike Podhozer wrapped up the panel with some advice for 2012:"We need to do a little less commentary on the failings of people who are built to fail [conservatives] and more about getting out there every day and holding whoever gets elected accountable. "It's time, he said, for people to take advantage of this amazing coalition and elect real, progressive candidates. With inspiration and spirits high, attendees of the Take Back the American Dream conference piled into buses at noon on Wednesday to flood Capitol Hill and make their voices heard. The crowd was a sea of "A's" - people of all ages, colors, and walks of life proudly held the banner of the American Dream Movement. 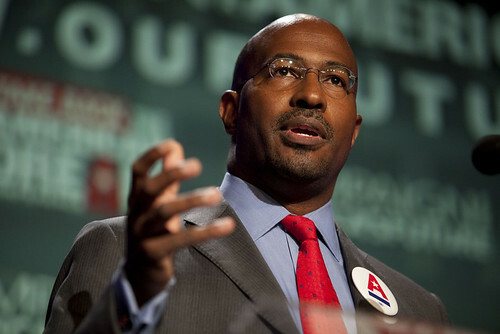 Check out footage from the rally here: Van Jones kicked off a list of fourteen speakers, who included everyday Americans that were hit hard by the economic recession and who came to tell the country their story. Congressman Keith Ellison (D- MN) made an appearance with words of encouragement for the progressive movement. "Let me tell you the good news," he said. "The progressive movement is on the upsring. All over America the movement is on the move. 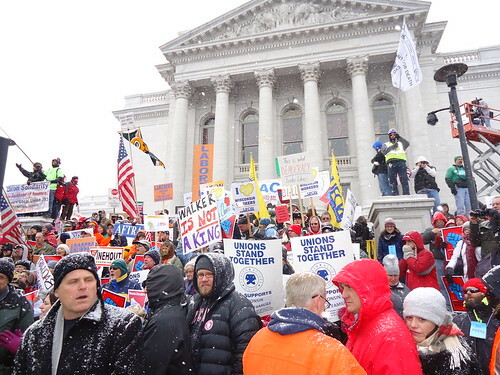 Everybody - do you remember how we fought for labor rights in Wisconsin? This thing is going to move. We're going to get the justice we deserve. "Both the highlight and heartbreak of the rally were the economic casualties, ordinary Americans who told their moving experiences of loss and struggle. Here are some of their stories:Linda Evans from Washington DC, a home healthcare provider who has been unemployed for three years. Her story brought her, and many of us, to tears. "I'm asking members of Congress - give us a chance. Fight for us. We're the ones that put you in office. Fight for us. How can you sleep at night," she cried, "knowing that youth are selling drugs just to make money? Save our babies!" Shawn Wygant of Pennsylvania, also unemployed, came to the rally to demand jobs and tell Congress to represent the other 99%. He has seen the need to improve infrastructure in his community, specifically a bridge in disrepair. "I could take a job fixing that bridge right now. If they called me right now, I'd leave this stage and fix that bridge." Tiffany Mellers, an army reservist and mother, now unemployed for a year. "When I came back in July 2010 from my deployment, I thought things would be different. I thought if I sacrificed for my country, my country would be available, accessible, and accountable to help me. Unfortunately that is not the case. I'm still an unemployed army reservist, actively looking for a job with three mouths to feed," said Mellers. "Americans like me are in every corner around the country, and we're finally saying enough is ENOUGH." Tiffany Loftin, vice-president of the United States Student Association (USSA), riled up the crowd and represented youth everywhere who are ready for change. "This is our country. This is your country. Take advantage of it. Be out here and make a lot of noise, because they have to respond to US. We're in charge. It's OUR agenda. Make sure you go back to your states, organize in your communities. Gather the young people. Educate them. Uplift them." "As of today, as of right now, the American Dream Movement is here to say NO MORE. The real people are here, the real patriots have reported for duty, and we are going to take back the American Dream from the people who want to kill it. We are the patriots." Mary Kay Henry, President of the Service Employees International Union, opened her plenary speech Tuesday with the story of an ordinary man who fought for extraordinary change. In 1902, William Queese was a janitor on the south side of Chicago. His day started at 5am and didn’t end until 10pm. Every single day of every single year he scrubbed, he painted and he cleaned. Quesse had no job security and no days off; and, for all his work, Quesse earned $20 a month. That is, until one day when he decided that he and his fellow workers deserved more. He gathered 200 other janitors on Chicago’s south side together and asked them one simple question, “Should we ban together and fight for a better life by forming a union?”Every single person said, “Yes.”Out of the frustrations of 200 fed-up apartment workers in 1902, BSEIU – precursor to SEIU - was born. 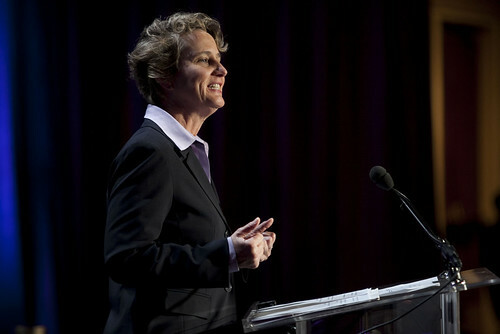 Today SEIU represents 2.1 million working people across the US, Canada and Puerto Rico.For Mary Kay Henry, it is this common belief in a right to a better life that will inspire the American people to unite and fight for better jobs, immigrant rights and economic equity.She borrows a page from Rev. Jesse Jackson’s history and speaks about his grandmother – too poor to afford a blanket. A highlight of yesterday's conference was a breakout panel on the legendary movements in Wisconsin and Ohio, which have inspired thousands across the country to stand up and fight back.Featured speakers included John Nichols of The Nation magazine; president of the Wisconsin State Firefighters Union, Mahlon Mitchell; Mike Pyne of the United Steel Workers; Doug Burnett of AFSCME; Courtney Fully from United Food and Commercial Workers; Bruce Colburn from SEIU; Mary Bell from Wisconsin Education Association Council; and social media guru Scott Goodstein. The panel opened with Mahlon Mitchell, who recounted the events preceding Governor Scott Walker's (R-WI) so-called Budget Repair Bill. In January, the same month Mitchell became president of the state's firefighter union, Wisconsin's government gave tax breaks to corporations, but told people the state was broke. Then Walker tried to take away the rights of state and municipal employees and teachers.The firefighters decided they could not sit idle. "We could be next," said Mitchell. "We were just responding to an emergency; there was an emergency in our state. "Mike Pyne of United Steel Workers saw the struggle as shared among all his brothers and sisters in the public sector. While the demonstrations drew the nation's attention, growing to thousands of people, Pyne pointed out that for change to be possible they needed a political component. "We had to take political action to intervene," he said.And fortunately, asserting power through the political process is a well-established practice in the state. Doug Burnett broke down Wisconsin's history of fighting political corruption as home of the recall election. According to Burnett, the recall was created to take those people out of office who had turned their back on the people. Or, for those "who had perhaps not disclosed when they ran for election that their real agenda was to eliminate the right to unionize in Wisconsin." Having that law proved critical in the struggle.For Burnett, Wisconsin's movement was about stepping up to the challenge that was Walker's budget bill. "We did not choose that recall fight, and we didn't choose the fight over collective bargaining. They chose it. But once they chose it and once we understood the magnitude of the movement that had been created in Wisconsin, we joined it in a big way," he said. "The lesson is: they picked a fight and we beat them back and beat them back hard. "But the fight didn't end in Wisconsin. Courtney Foley of United Food & Commercial Workers represented the new front - Ohio - where the attack on collective bargaining and the response it has triggered are developing rapidly. "It's really interesting when you look at the short timeline of what happened in Ohio" said Foley. "On February 7th, SB5 was introduced. By March 30th, Governor Kasich had signed it into law. And in 8 weeks, on June 16th, We Are Ohio had more signatures than we needed to file already. In 8 weeks! "Foley recalled that as they unloaded all the petitions, engineers had to come weigh the room because they thought they'd break the floor. They'd never seen so many petitions in an office before.Bruce Colburn of Wisconsin's SEIU shared his thoughts on the coming year. "One thing you can say, there WILL be a recall of Scott Walker in Wisconsin this year." And the fight won't stop there. People nation-wide will have to stand up and make sure their state governments feel the magnitude of the struggles that have set a precedent in Wisconsin and Ohio.In the words of Colburn, "We have to start fighting not just not to lose, but to start to win." Friends and leaders in the American Dream Movement gathered on stage the Take Back the American Dream conference on Tuesday to discuss the Contract for the American Dream, actions to support it, and to paint a picture of just what it is that we're trying to reclaim.Our friend Dheepak Bhargava from Center for Community Change kicked off the panel to talk about what people are already doing on the ground with his organization to fight for an empowered and growing middle class, highlighting leaders in Ohio who organized to beat back Ohio's Senate Bill 5 which would gut labor protections for public workers that took a century to build up. (Dheepak was quite modest about his own role, but MoveOn.org's Justin Ruben described him as the movement's Meryl Streep - good looking, he's everywhere, and if he's in something, you know it's going to be good. )Dheepak passed to the torch over to Justin Ruben, MoveOn.org's executive director, who took a moment to explain just what the Contract for the American Dream is. When looking at this rising movement of people protesting across the country, MoveOn and allies began asking themselves, what are the core ideas we're pushing for? Instead of defining what they thought the vision for an economy that works for all Americans should be, they asked progressives around the country to weigh in on an open platform. Over 130,000 people weighed in with nearly 30,000 ideas and 6 million ratings on the submissions. The "truism" for progressives has been that we lack new ideas, but we've definitely disproven that notion with the Contract, with a robust number of solid ideas and thoughtful feedback that produced a vision of how we can create good jobs and have the money to pay for them.But Ruben pointed out that having the tool is great, but now we need to use this tool. We need to take it back to our communities and run with it. Millions of people in America know there's something wrong in America and are waiting for our vision. He called out an audience member, Bill from Kansas, who has already begun the work of building progressive communities all across eastern Kansas galvanized by the vision laid out in the Contract. We also need to show art and music inspired by and tied into the notion that the middle class is worth fighting for, worth protecting and growing. This is only the beginning.Leo Gerard, president of United Steel Workers, followed Ruben and really hammered home the point that if we want to create jobs and stabilize the middle class in this country, we've got to start making things again. But before he got to that, he really expressed excitement for the courage and discipline of Occupy Wall Street, and he told the audience. "Wherever it happens, in whatever city, Occupy Wall Street needs us." Gerard made some really smart points about infrastructure, outlining how we can create good jobs and clean up some public health and safety hazards by renovating schools, where millions of children currently sit 9 months out of the year in poorly ventilated, crumbling school buildings. Leo Hindery, the noted progressive businessman, mirrored Gerard's policy talk to outline better policy on progressive taxation, namely a financial transaction tax. Hindery mainly urged us to be bolder, to take a big step instead of a baby step as our first foot forward. He thought we should be bolder than the Buffett rule with a significantly higher tax rate on the wealthiest Americans, and without a doubt supported a financial transaction tax. The last two panelists made comments that made for an interesting mirror. Rep. Jan Schakowsky recounted that she grew up in a different America, with a growing middle class that could depend on a good job, with adequate pay, vacation time, healthcare, and retirement. She shared that she was able to get an undergraduate degree without going one cent into debt! Schakowsky detailed how that middle class dream, where you could work hard and pass on a better future to your children, were attacked and slowly chipped away over the last generation, with assaults on organized labor, fair taxation, and the social safety net. Erica Williams of the Citizen Engagement Lab started out by explaining that she was a from a different generation, a generation who hasn't experienced the same security and sense of place in this country, which has led to a crisis of democracy. When people over a generation feel marginalized, they lose their sense of power, their sense that they have a stake in society, which drives a vicious cycle that leads to further marginalization. We have to reverse this by putting the power back in their hands, by showing them that they "have power because of who they are", that they don't need to be a lobbyist or well-connected to change our country for the better. We have another dispatch from the Take Back the American Dream Conference, this time from the inimitable Adam Green, the co-founder of Bold Progressives.